I've been working with a neural networking practitioner from Australia. How the Do Good Gauge exercises subjective thought is of interest to Mitch Smith. He sees a potential for the plasticity of neurotransmitters to be stretched. In other words, he sees how it could soften hardened minds. Mitch, "... as we age, any neural paths that never change get "myelinized" - a fatty coating forms on the dendron / synapse / neuron / axon path that freezes the connection in place. It makes the path a lot faster, but very hard to change - so a lot of local minima get "set in stone" so to speak." Mitch, "... It is a bit like a ball rolling down a rabbit hole - if there's a little dip in the slope, the ball can get stuck in it and not reach the bottom. So for instance, if you are training the network to recognise the alphabet, it might start insisting that a Q is an O - it has a false belief about Q. To get it out of that false belief, you have to start injecting noise into the system to overcome the "dip" and get the ball rolling again." Scott, "You touch on something I've struggled with for so long. Conservative vs Liberal. You put a clinical understanding on these terms. Conflict is reduced when the physical truth is revealed. Distant from truth our subjective thoughts must deal with confusion and chaos. Many would find it difficult to call Noam Chomsky a conservative, but how you describe the myelin effect shows an old man and those who criticize him with the same steadfast behaviour. There is an aspect of the political divide defining insanity as any non-conservative exceeding 40 years of age. In understanding the clinical aspects of myelin the truth is revealed. Once the effects of myelination takes hold it is painful to change a subjective opinion. Association is a cognitive process to counter the resistance for change. I was explaining to my 14 year old son about exercise. How it takes 21 days to form a habit. On the 22nd day it is no longer torture to exercise, it's torture to not. Association exercises the brain. 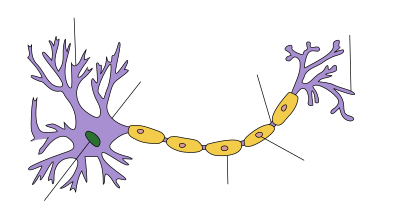 It's possible myelination has similar characteristics as muscle atrophy. If so, association is a neurostimulation to re-examine a false belief and to improve a steadfast mind." Association is the key to the Do Good Gauge. David Hume described the power of association in a chapter titled, Of the Connection or Association of Ideas in his book, A Treatise of Human Nature over two hundred and seventy years ago. An association could be a quotation from Alice in Wonderland, a reference to a New York Times op-ed, Article I Section 10 of the United States Constitution, between 3 and 5 minutes into Tourgée's oral argument of the United States Supreme Court decision of Plessy v. Ferguson, or it could be a specific fallacy such as the Red Herring. I've never explained how to associate a thought. It's easy. An essay is fundamental to an idea. Like a book an essay has an edition or a release. An essay is a collection of thoughts. Let's call each thought a chunk. A chunk is what we apply association to. It is through association an author acquires knowledge from the public. Such feedback describes the relevancy of a particular thought to the subject as a whole. It gives hint in the accuracy of a chunk, whether it conflicts with the truth, or whether it polarizes the audience. Association gives evidence an author may not have considered. Association provides the motivation for an author to create a new revision of a thought. An outline is a snapshot of chunks in a given time. The outline provides the horizontal and vertical position of each chunk for a given release of an essay. There are three gauges relating to the Do Good Gauge concept. One gauge measures the relevancy in the association of one object to another. One extreme of this gauge represents highly relative and supportive, the other extreme is highly relative and counter supportive, the centering point is non-relative. Here is an example of how the relevancy gauge would work. When an average score of an association is centered an author is made aware of the polarization or conflict his or her chunk is having on an audience. Such notification provides the motivation to re-write the chunk with the hope a new essay release will acquire higher audience convergence. The second gauge measures the quality of an essay on an five point academic scale where A-Excellent and E-Failing. The third gauge provides the means to support an Intellectual Currency. 2¢ Worth is a voluntary system where each user applies a level of funds to their account. Unlike the second gauge which is a subjective measurement of quality, 2¢ Worth measures reader empathy. Empathy is a motivator to an author. Money talks. I'm not speaking of a lot of money. The idea is to allow each reader to voluntarily donate an amount equivalent to a newspaper subscription, say $20 a month in the United States. This amount would be pooled in a user's account where over time it is distributed to authors accounts when voting on different aspects of each essay. The goal is to distribute 99% of all donations to contributing authors. This Intellectual Currency would be international. That is the system will accept international funds coming in and going out. In the United States each essay would have a five point scale with 2¢, 5¢, 10¢, 25¢, and $1. Mitch and I are currently refining the consequences of this funding distribution system. Mitch believes the topology of the idea would be enhanced by applying 2¢ Worth during the association process. The Do Good Gauge provides the means to percolate the wisest thoughts from the masses. It is a bottoms-up approach in the neural transfer of intelligence. My friend from Australia identified this in the Do Good Gauge proposition. He helped understand the aggravation received from groups like the Zeitgeist, Ethos, and from people like Noam Chomsky, and Lawrence Lessig. The fame of these groups and individuals influences a top-down/hierarchical system of reasoning and problem solving. Noam Chomsky, who I have been fortunate to correspond with, has a sense of entitlement to the problem. And yes Noam and the Zeitgeist define the problem elegantly. It is the incapacity to see the solution that fails them. The rabbit hole defines an "Intellectual Currency" to flesh out the wisest solutions from the masses. If the answer does not exist in the whole more can help keep the avant-garde from destroying the burrow. By taking the red pill you have acquired a glimpse of the solution to the problem plaguing humanity. If you choose to stay in Wonderland, you will see how deep the rabbit-hole goes. Come on, it goes deeper!